Twelve community projects in the Harrogate area were given a boost recently, thanks to the help and support of over 200 staff from ventilation manufacturer EnviroVent. 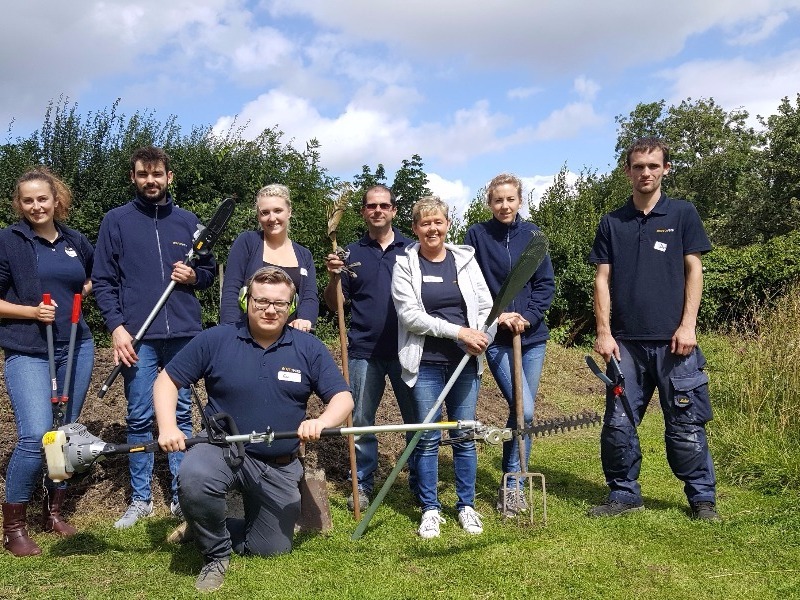 EnviroVent staff, normally based at Hornbeam Business Park in Harrogate, were given a day away from work as part of an ‘In it together’ initiative where they volunteered to help out on a range of worthwhile community projects. This included assisting with the set-up of Urban Beach Party at Henshaw’s Society for Blind People in Knaresborough, which involved painting signs, decorating and carrying out general maintenance to make sure that the centre was all set up for its party, raising much needed funds for the charity. Other staff from EnviroVent took part in community singing with Dementia Forward, some took on a charity car wash that pitted two teams against each other to wash shoppers’ cars to raise funds, whilst another team took on the task of clearing grounds and the garden at St John’s Church in Bilton. The volunteers also helped to give local carers a break supporting The Carer’s Resource in Harrogate, whilst another team of staff took part in helping Horticap, a unique garden for adults with learning disabilities nestled in the Harrogate countryside, with maintenance work. Other volunteers cut back hedges and carried out general ground maintenance for Pannal Ash Junior Football Club and Fountains Abbey. The teams also helped with odd jobs, gardening and decorating for people who are losing their sight and being supported by Vision Support and for the Help at Home Service on behalf of Harrogate and Ripon centres for Voluntary Service. The volunteers also helped to cook and serve breakfast at Harrogate Mind, as well as helping the charity to organise a pool tournament. The activities were arranged by EnviroVent in order to provide a positive impact on society. EnviroVent plays its part in putting back into local charities and has helped to raise £35,000 for Saint Michael’s Hospice in Harrogate over the past few years.